The quality of Marlene’s work is exceptional. – It is simply unmatched. For that reason, I recommend her to all of my clients. I cannot thank you enough for the wonderful work you did on my teak furniture. You brought my furniture back to life with such care and consideration for my yard and patio. I also want to thank you for arriving precisely on time and completing the job as promised. It will be my pleasure to recommend you to clients of Prudential California Realty. I just wanted to thank you for taking care of Mrs. Givani’s teak furniture. She was extremely pleased with the cleaning and sealing job you did and is going to recommend you to her sister who has some teak projects to be done as well. It is great to have you as a source for my clients. The many satisfied customers you have worked with on my behalf reflect the professional job you do. Marlene did a great job on our teak furniture. They cleaned two Brown and Jordan chamber lounges that were black in spots, and a teak umbrella that was almost as bad. The pieces came out beautifully, and her crew was on time, neat and very professional. I would definitely hire them again when the pieces need more care. I’m sorry it has taken me so long to send off this letter. I have wanted to write you to tell you how great our Mission Teak furniture looks, especially after you used sealant on the table. As you know the furniture is eight years old, but you have really brought it back to life. I was also impressed with your dedication to doing a good job and having customer satisfaction. Your professional approach, and your quick response to coming back for a touchup was admirable, and will surely make me want to use your service again as the furniture needs it. Your teak cleaning service is much needed for anyone who has purchased teak for outdoor used, and I wouldn’t hesitate to recommend you. 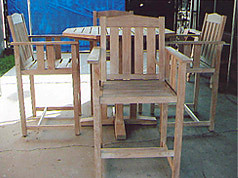 Thank you, thank you, thank you for the beautiful job you did on my teak furniture. The pieces look spectacular. 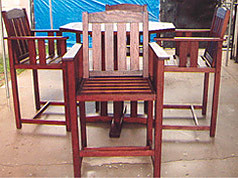 Thank you so very much for the wonderful job you did refurbishing the teak furniture at my home. I honestly believe it looks better than when it was new! You carefully listened to what I wanted and executed the work flawlessly. Do not hesitate to use me as a reference for other clients, I look forward to recommending your services to my clients as well.